Alaska Avalanche Information Center to host avalanche training courses March 1-5 in Sitka (CORRECTED) | Get Out, Sitka! Alaska is a land of big adventures and wild, open spaces; a place where anyone with little skill can jump on a snowmachine or skis and be surrounded by wilderness within minutes. The very reason so many people come to this country. But Alaska is also known for the greatest number of unintentional injuries and deaths per capita when it comes to outdoor incidents like avalanches, drowning and snowmachine crashes. Every year the Alaska State Troopers, Alaska Mountain Rescue Group, and other professional agencies and organizations respond to dozens of search and rescue calls when people find themselves in situations they are ill prepared to handle. Will you know what to do and be prepared with the supplies you need if you become trapped by weather, mechanical failure or other situations and suddenly find yourself forced to spend an unexpected night out? If you or someone in your group gets injured, will you have the knowledge, supplies and confidence to manage medical emergencies? If you answered no to any of these questions, you owe it to yourself and your family to attend the Alaska Backcountry Preparedness – Live to Ride Another Day – program made possible with support from the Alaska Department of Public Safety, Division of Alaska State Troopers. This free training is designed to help you learn and practice the skills you need to prepare for your wilderness travels and adventures. The Alaska Avalanche Information Center’s team of professional instructors has developed a captivating, interactive program to teach these critical skills and to help encourage outdoor recreation for healthy lifestyles. 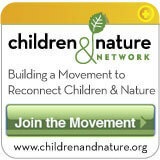 This program is coming to Sitka on Thursday, March 1 through Monday, March 5. (NOTE: The following schedule has been updated from what was originally reported.) 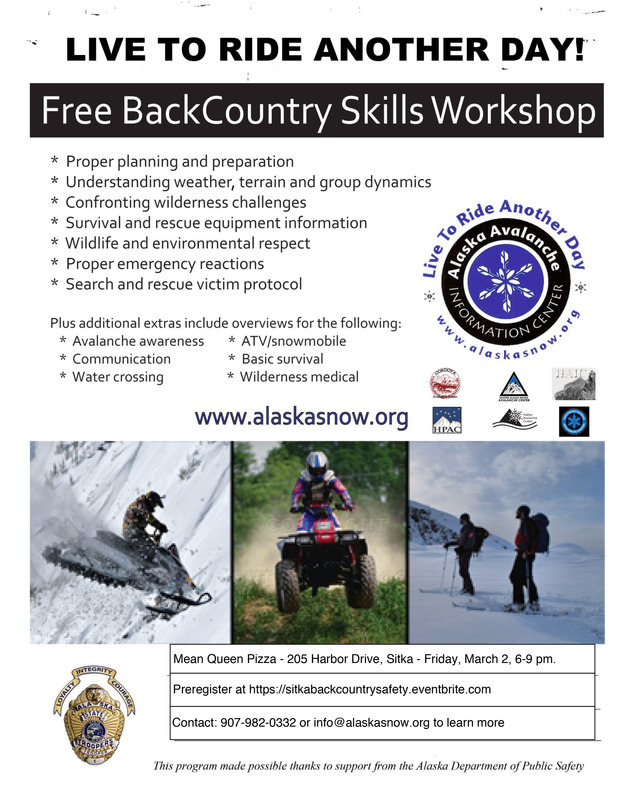 It will be available for school programs March 1 or 2, and it will host a free community backcountry skills workshop from 6-9 p.m. on Friday, March 2, at the Mean Queen (lower level). The Alaska Avalanche Information Center also is offering a three-day Avalanche Level 1 course on Thursday, March 1, through Sunday, March 4). This is a 24-hour course and compliant with the American Avalanche Association training standards. The course opens from 6-10 p.m. on Thursday, March 1, at a location TBA, followed by a 6-10 p.m. session on Friday, March 2, at the Sitka Fire Hall, with field days from 8 a.m. to 6 p.m. on Saturday and and 8 a.m. to 5 p.m. on Sunday at locations TBA. The Avalanche Level 1 course costs $306. Learn more and register for these programs at http://www.AlaskaSnow.org/Education or call (907) 376-2898. Meredith Condon is the local coordinator for the event and she can be reached at (703) 201-6495 or Meridith.R.Condon@gmail.com. This entry was posted in Kids and nature, Outdoor events, Outdoor programs, Training and tagged Alaska Avalanche Information Center, Alaska Backcountry Preparedness — Live to Ride Another Day — program, Alaska State Troopers, American Avalanche Association, ATV/snowmachine safety, avalanche awareness, Avalanche Level 1 course, backcountry skills workshop, basics of survival, communication, companion rescue skills, Mean Queen, Meredith Condon, Mountain Rescue Group, outdoor education, search and rescue calls, Sitka Fire Hall, trip planning, water crossing, wilderness first aid, wildlife awareness. Bookmark the permalink.